The majestic Himalyas, with flags flying in the foreground at the Pyramid laboratory. Canada’s international scientific expedition to Mount Everest is preparing to depart for Nepal on Sunday April 22. 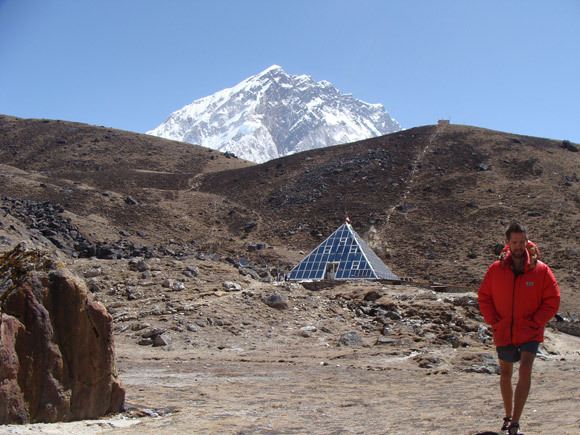 Everest 2012, a six-week, six-country research investigation into the effects of heart and brain blood flow and oxygen deprivation at high altitudes, will settle into the Pyramid Laboratory near Everest base camp for a six-week stay through the end of May. The acclimatization process takes two weeks including the final leg of the journey, an eight-day walk to the remote lab, 5,050 metres, or five kilometres above sea level. The 25-member expedition will be weighed down by about a tonne of gear and equipment, though the burden will be eased by use of yaks, which will carry some of the load. Expedition leader Philip Ainslie, Canada Research Chair in Cerebrovascular Function in Health and Disease and associate professor in the School of Health and Exercise Sciences at the University of British Columbia’s Okanagan campus, says the scientific and medical experiments are designed to mimic the symptoms and outcomes that occur in heart and stroke victims and those suffering from sleep apnea. The Pyramid Laboratory seen in winter. “This is an opportunity to take healthy people and expose them to low levels of oxygen to see how their heart, lungs and brain adapt or maladapt to that exposure,” says Ainslie. Hypoxia can severely decrease oxygen delivery to the brain. Reduced blood flow to the vital organs is characteristic of many chronic conditions. 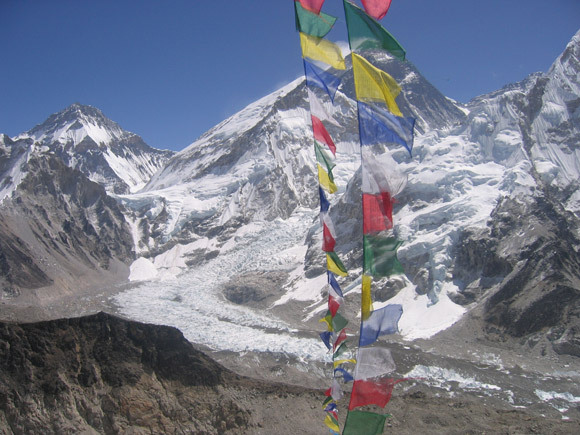 The comprehensive Everest research study, titled Integrative physiological adaptation to high-altitude: a scientific expedition to explore mechanisms of human adaptation, encompasses eight separate experiments ranging from cerebrovascular, cardiopulmonary, and neurocognitive health to measuring the effects of acute mountain sickness and sleep apnea. “The research we conduct and the results we achieve have the potential to provide new insights into illness prevention and better human health,” says Ainslie. The pioneering expedition is expected to achieve a number of firsts in terms of scientific investigation and discovery. Expedition members will themselves be the test subjects for the experiments. Many of these were initially conducted as baseline studies at UBC’s Kelowna Health and Exercise Sciences lab during March and April. Team members travelled from Australia, the Netherlands, New Zealand, U.K. and U.S. to take part in the procedures. Some experiments, like one measuring pulmonary arterial hypertension, involves invasive minor surgery to place arteriovenous shunts in wrist and neck arteries to measure acute hypoxia (oxygen deprivation) following ascent to high altitude. A physician and bioengineer from Duke University, North Carolina, were in Kelowna recently to conduct the baseline research and they are part of the Everest 2012 team and will supervise the experiment at Everest. “This was the first time that these procedures have ever been done in Canada,” says Ainslie. The international contingent includes members from UBC’s Okanagan and Vancouver campuses, Okanagan College, Duke University, University of Oregon, University of Sydney, Mount Royal University (Calgary), University of Cardiff, University of Otago (New Zealand) and University of the Netherlands. Members of the team include researchers, sleep technicians, physicians, a bioengineer, and a hardware/software specialist. Lauren Ray of Nelson, B.C., a third-year Health and Exercise Sciences student at UBC’s Okanagan campus, is excited to be part of the Everest excursion. 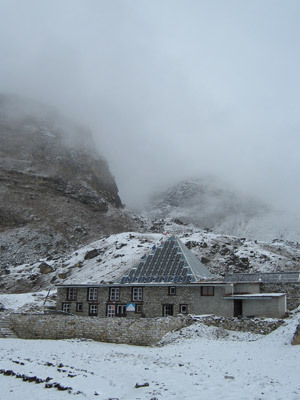 The Ev-K2-CNR Pyramid Laboratory at Everest base camp in the Khumbu Valley in Nepal is one of the only facilities in the world where all eight experiments can be conducted on members of the expedition, including invasive procedures and the study of sleep apnea, a common occurrence at high altitudes. The expedition also plans to test a number of permanent high-altitude residents of mountainous Nepal, recruited from the Periche region, which is at 4,200 metres. Some have already volunteered for earlier experiments through collaborations with local physicians and scientists. Ainslie – an accomplished mountaineer who has been to Everest several times – says the conditions in the Himalayas offer the best and most cost-effective opportunity to conduct research. 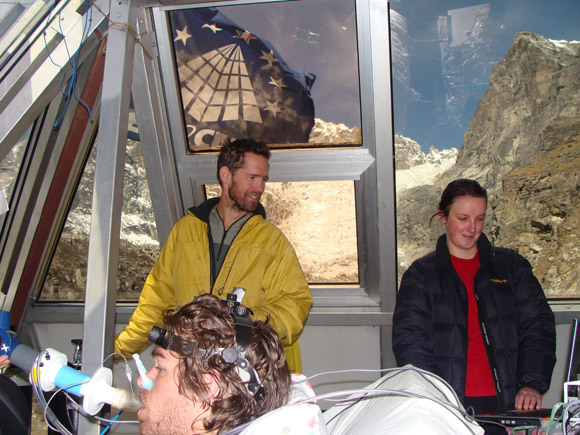 Canada Research Chair Philip Ainslie (centre) is seen conducting experiments at the Pyramid Laboratory on a previous research mission to Everest Base Camp. Researcher Mike Stembridge from Cardiff University, Wales, measures respiratory responses in the Health and Exercise Sciences lab in Kelowna, as UBC student Lauren Ray exercises on a specially built collapsible bike that will accompany the research expedition to Mount Everest.